Svetlana Petrova is an artist, producer, and curator living in St. Petersburg, Russia. She is the founder and director of the International Festival of Animation Arts, "Multivision." In 2011, she created FatCatArt.com—an experiment to combine art history and the spirit of LOLcats. Her "famous paintings improved by cats" went viral and became an internet sensation. She adopted her feline coauthor and mews, Zarathustra, when her mother died. Loved and spoiled by Svetlana’s mother, this 8-year-old ginger tabby cat is 10 kilos of pure undisturbed joy, although he is trying to diet. "Every nerd loves a great cat meme, and artist Svetlana Petrova’s work on classic paintings featuring her big ginger cat Zarathustra takes it to a whole new level." 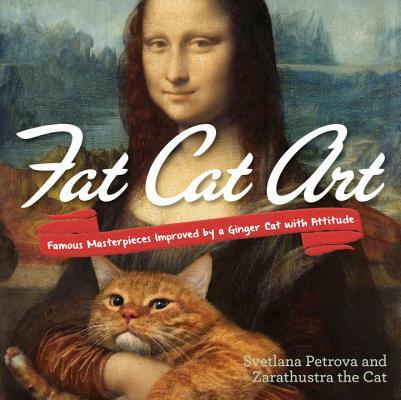 "Russian artist Svetlana Petrova has created a series of cat-infused classic art pieces. An ode to her own cat Zarathustra, Petrova's work is unlike any other series." "Now that's what we call a masterpuss." "A Russian artist has taken hundreds of classic paintings and Photoshoppped her pet cat Zarathustra into them, making them, in our opinion, 89426576 times better."